Boost your skincare routine with the NIOD No 1 GIft Set, a skincare set for those looking to take their beauty regime to new heights. A great way to experience NIOD skincare, the NIOD No 1 Gift Set contains four best-selling NIOD products. Complete with travel-friendly sized solutions, this peptide-charged set will enhance your entire routine. The ideal entry route into the NIOD skincare range, Set No 1 lets you experience a hand-picked selection of top rated skincare picks, that will blow your current beauty routine out of the water. Low-Viscosity Cleaning Ester 50ml: This skin cleansing system will remove makeup in single step, whilst respecting the skin’s dermal barrier levels. Fractioned Eye Contour Concentrate 3ml: Specifically designed for the eye contour, this hyper-concentrated bio-serum will target all aspects of eye ageing. Multi-Molecular Hyluronic Complex 15ml: Enriched with 12 forms of hyaluronic compounds in a peptide-charged delivery system, this advanced serum will comfort and rehydrate the complexion. Photography Fluid, Opacity 12% 15ml: This serum-textured treatment will provide an instant boost of radiance, whilst blurring imperfections for photo-ready results. 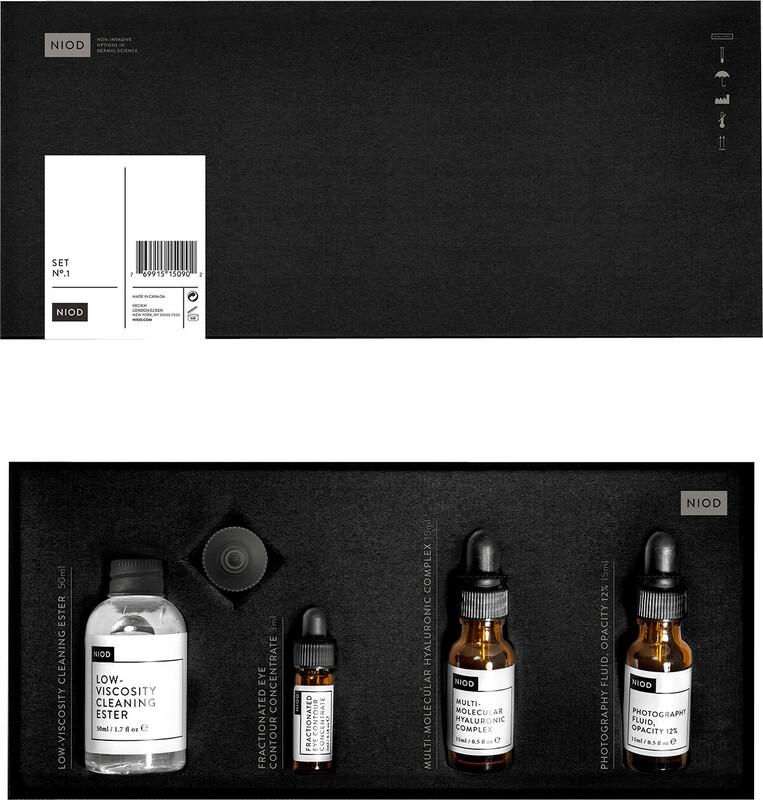 NIOD No 1 Gift Set is rated 5.0 out of 5 by 1. Rated 5 out of 5 by Cajsa from A gem from NIOD - a DECIEM brand I bought the sample box/gift set with four different NIOD products and they are all really good products and also quite unique! The box is worth it’s price and the products last for long. Can clearly recommend them all – I only wish the Copper Amino Isolate Serum 1% was included in the sample box as well….